- Indoor air can have 5x as many pollutants as outdoor air. - Pollen, dust and other allergens can float in the air inside your homes for hours. - Flu and cold viruses can live in the air for several hours. Protect your family from the air they breathe with Fellowes AeraMax Air Purifiers, which safely remove 99.97% of airborne particles as small as 0.3 microns. The AeraMax Air Purifiers are also extremely effective at capturing the Influenza A virus from indoor air (based on independent testing). 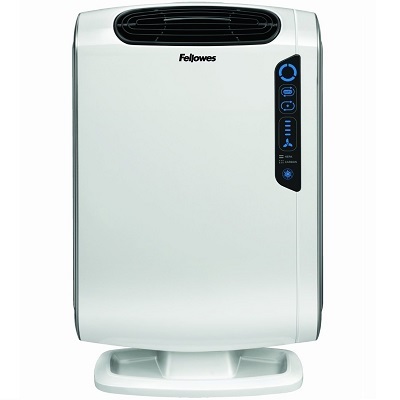 - Effectively purifies air in medium rooms 200-400 square feet. - AeraSmart Sensor monitors the air quality and automatically adjusts the fan speed to keep your air purified. - True HEPA filter with AeraSafe antimicrobial treatment safely removes 99.97% of airborne particles as small as 0.3 microns, including pollen, ragweed and other allergens, viruses, germs, dust mites, mold spores, pet dander and cigarette smoke. - Extremely effective at capturing influenza virus from indoor air (based on independent testing). 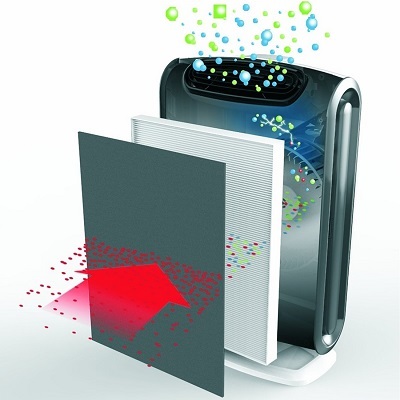 - Carbon filter removes odors and captures large airborne particulates. - Aera+ Mode for allergy and cold/flu seasons.